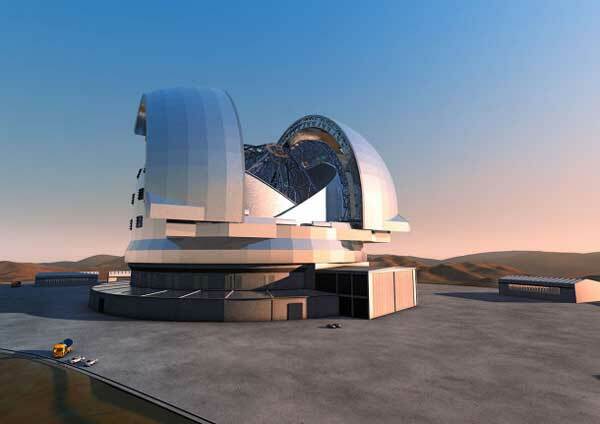 Inter - Governmental astronomy group the European Southern Observatory votes to begin construction on the the world's largest optical/infrared telescope. An artist's rendering of the European Extremely Large Telescope. Note the extremely small automobiles. No, it's not something out of a Monty Python sketch. The "European Extremely Large Telescope" is, in fact, a real project. And it is, in fact, extremely large. Or it will be, once it's built -- it'll be the world's largest optical/infrared telescope, actually. And with the recent vote to move the project beyond planning stages, the E-ELT may well be operational by sometime early in the next decade. The European Southern Observatory, or ESO, which bills itself as "the foremost intergovernmental astronomy organization in Europe" (and is the organization behind the not-quite-so-impressively-named Very Large Telescope), gave the thumbs-up earlier this week to start construction on the E-ELT. That kickoff pends final approval by the governments of four member states -- and the honoring, by member states, of their stated financial commitments to the project. From its home atop a mountain in Chile, and with its 131-foot main mirror, the E-ELT will, the ESO says, "tackle the biggest scientific challenges of our time," including looking for habitable, Earth-like planets in other solar systems; measuring the properties of the first stars and galaxies (and performing "stellar archeology"); and probing the nature of dark matter and dark energy. The European Extremely Large Telescope is on the far left, alongside the ESO's Very Large Telescope, and the extremely triumphant Arch de Triomphe. The ESO says the telescope will be "four to five times larger than the present-day state-of-the-art facilities of this kind, and will collect about 15 times more light. It will also be much larger than the two other extremely large telescopes in planning, the Thirty-Meter Telescope and the Giant Magellan Telescope." But it's not all about size. The E-ELT will also feature the latest in high-tech astronomical wizardry, including an adaptive mirror which, with the help of 6,000 actuators, will be able to distort its shape a thousand times a second to compensate for fuzziness produced by atmospheric turbulence. The telescope's can observe over a wide range of wavelengths, from optical to mid-infrared. "The E-ELT will...lead to an extraordinary harvest of exciting science," Xavier Barcons, president of the ESO's governing council, said in a statement on the ESO's Web site. 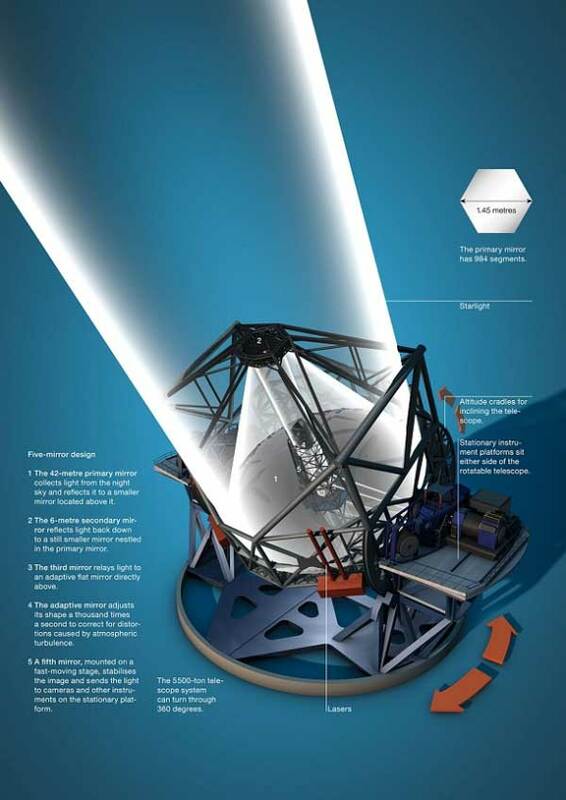 The cost of the telescope is estimated to be about 1 billion Euros ($1.26 billion).